I’m so excited to be sponsoring this giveaway. I LOVE fabric and I buy it…even if I don’t know what I’m going to do with it. You could also bust out a lazy girl quilt with some co-ordinating fake valances…for your guest room that you need to get ready for the holidays! The world is your oyster! You could also leave your fabric on a shelf and gaze at it while you drink your morning coffee…you have my full permission! Giveaway open until Thursday, Nov. 19th. This is open to Canadian and International. Fabric.com doesn’t ship to all countries, so check their site to make sure they ship to your country before entering. I will announce the winner on Saturday, Nov. 21st. Good luck and don’t forget to go check out all the other giveaways at Nesting Place. I want to makes some pelmet boxes for windows in our master bedroom, and cover a bench for my baby's room! Great giveaway! I'd use it to buy fabric to FINALLY slip cover our couch and chair. I've been putting it off but our chair is starting to get holes in the fabric on the arms. I have a fabric addiction, so there's lots I could use it for 🙂 I'd buy fabric to slipcover two armchairs for my living room. I would love the opportunity to redo my toddler's room. She is two and just became a big sister (in August) and she needs her own space with her own style! We'd make a quilt, window coverings, pillows, and redo a children's rocking chair! In a variety of fabrics in variety shades of PINK! And Polka Dots! I have no idea WHICH project I would use it on, but I have plenty of ideas!! i would love to make pillow covers and window dressings. Well…this is easy. I've had my eye on some linen to start the MB redo. I LOVE fabric.com!! I've had you in my Reader, but I'll gladly subscribe for a second chance! Great giveaway! Please enter me in the giveaway I would love to recover my dining room chairs! I would make a quilt for my Caden. Heck yeah! 😉 I need curtains for my new house! Woo hoo! This is awesome! I would LOVE to win and get some fabs to make pillow covers for my newly slipped sofa! What if we're already subscribers?? I would most definitely make the curtains I have been putting off for so long! I think I might recover my dining room chairs! Thanks for all the inspiration! I have an order coming from fabric.com right now, so I would happily get more fabric for new curtains and/or slipcover fabric – I'm picking up the cutest chair from Craigslist this week! I'd really like to make a slipcover for my sewing room sofa or a new coverlet for the guest room. Thanks for a great giveaway! I would get some white cotton duck to make a slipcover for my couch! YEAH! I believe that I would look for some fabric for new curtains for my office. I could use something fun in there! Great giveaway! I'd like to make some new curtains for my guestroom. I need it! Please oh please! I'm afraid I'll have to do something drastic to get this done if I don't win. Oh I have some serious need for window treatments in my living room/dining area. Yup…. I would love the $75 gift certificate to make some fun pillows for us!!! I would buy fabric to make curtains for my den and tie the whole room together. I've got a ginormous sectional I need to slip….I would LOVE to spend $75 on a beautiful carmel colored twill for it! That's what I would buy – fabric to make slipcovers for two chairs! Would love to win. I would recover my cocktail ottoman…fnally! I follow your blog thru Google Reader! Count me in! I would slipcover 2 chiars i have!!! I would start making the slipcovers to cover my chair and sofa in the playroom. Thanks for a chance to win! Would love to recover my sofa!! That would be fantabulous!! It would be like an early Christmas. I have been wanting to make a clutch and purse! Thanks for the chance. I have so many little projects that I need/want fabric for for the holidays….crayon rolls for my twin daughters, aprons for my mom and mother in law, bean bags for my 1 1/2 year old little guy and the list goes on! I would recover the chairs in my living room. I'd like to try my first slipcovers for two armless chairs in my den! What a great giveaway. I love the selection of designer quilting fabrics they have and would probably splurge on a few Amy Butler sewing patterns and fabric. I'm trying to build up a fabric stash for fun projects. I'd love some Amy Butler fabrics! I'd finally get to slipcovering the giant chair and ottoman in my living room! Chair with great bones hiding in my den – but not hidden enough from loving husband…I would finally decide on a fabric and get it done! I would love some new fabric to create a funky-sweet table skirt for my sewing/crafting table. That would be a little icing on the Christmas “cake”! We just repainted our bedrooms so I'm dreaming of curtains and pillows! I subsribe and love your blog. Pillows! Lots and lots of pillows!! I would love to make some curtains for my living room. I'd buy the fabric that I need to finish the quilts I've started for my two boys! I have an ottoman to slipcover and I need to make Christmas jammies for my kids. I would SO love to win this! i would LOVE a little extra fabric!! i have about 2,000 ideas of what i would do with it… but most likely would be to slipcover my ottoman/foot stool thingy! With my $75… First, i would find the perfect print to sew drapes for my Master bedroom! With whatever was leftover, I would either get fabric for roman shades in my grrls' room — or for a slipcover to put over the cute little club chair I picked up at the local thrift store! I need to make a ton of new pillow covers for all over our house! If I won, I'd get fabric to make a new duvet cover for our bedroom. i'd buy fabric and beg my mom to sew me some slipcovers for my wingback chairs! This is the best giveaway! I'm so excited and would love to feed my addiction to fabric. I'd make new curtains and a bed skirt! Yes, You are in my reader! I'm going to be needing fabric for curtains, fabric for a bedcover or quilt, and fabric for pillows for the casita which we're turning into a guest house. I have a rocking chair that I picked up at a thrift store for $10 that needs a paint job and some new slip covers. I have already scoured fabric.com and chosen my fabric! I have been dying to make a slip cover for my couch! I even have a sweet group of friends to help me. I figure we would have our own slip party…just like you and nester! All I need is the money to buy the fabric!!! I am dying to make some new pillow covers, so that's what I would do with it. I need a few more things to make my slipcover for my wingchair too, something I'm terrified to do, lol. The piping really intimidates me! I would make summer slip covers for my couch and chair! I'd buy fabric to slipcover a settee with cute lines that I've been hiding in a corner because of it's country check not fitting in…lol. And any leftover would go to some pillows. I really, REALLY want to make sofa slipcovers. REALLY, really. I just don't know if I can squeeze that in between now & the holidays! Otherwise it would be, hands down, a quilt for my older son's bed! This is a dream giveaway! I've got drapes to sew, chairs to recover, a quilt to back, and on and on. I really want to try slipcovers so that would be my first purchase! If the slipcover didn't work, I would use that fabric for quilting! I do need to slipcover my sofa!!! This would be the perfect opportunity!! I would love to have some pretty fabric for recovering my dining room chairs! I need to make a quilt for my daughter's “big girl” bed, that we are getting her in december! This would help so much! I have been wanting to make a new duvet cover with ruffles and pillow shams. I am also now a follower of your blog. I'm dying to try my hand at slipcovering, and there's lots of furniture candidates around my house! Thanks for the opportunity! slipcover my couch of course! I would love to make a simple quilt. Well, I have already bought material for a slipcover, but I still need the fabric for new pillows!! I would make a slipcover for my recliner and an ottoman. I'd get fabric to recover my sofa, and the dining room chairs. $75 may not be enough to do all of that, but it would be a great start! Oh fun!!! I would LOVE to slipcover my sofa! Oh, where does a girl begin?? Since I've found you , I am inspired to attack the couch. would love chocolate colored fabric to make the slip covers. Then off to the dining room chairs,windows,and the list goes on. I would buy fabric for a twin quilt and baby crib quilt. Thank you!! Oh WOW! I would just go crazy and buy anything cute. I love fabric! I'd love to make a new duvet for our bedroom…or some new curtains and pillows for the living room…the sewing projects never end!! Oh my gosh. I need curtains so badly in my bedroom. I'd buy some fabric to make them. What a fun question! I've got a little guy on the way and I'd love some fresh fabric to make him a quilt before he arrives! I need new drapes for my french doors in the family room! I have several things I could do with with the fabric…. 1) buy fashion fabric for clothes for me (which would add to my already mountainous pile)or 2) buy some fabric to finish off my master bedroom bedding- pillow shams,etc. Just redid that room and need to update the bedding, or 3) buy some boy fabric to make a few baby boy gifts that need to happen (lots of girl fabric here but boy fabric is severely lacking!) Love fabric.com. Been on a limited budget of late so not spending on fabric as I have in the past… seeing some withdrawl symptoms! I want to make a purse! I think I'd have to get some fabric to make fun Christmas gifts like aprons and pillow covers! I would slipcover my grandmother's chair that I inherited two years ago. So many things I could do with $75 of fabric: curtains for the girls' room, curtains for my sewing room, pillows for everywhere, dresses for the girls, shower curtain for the guest bath….the list could go on and on! I would probably use the fabric to make a loveseat slipcover. I would use the fabric to cover my two Craigslist wingback chairs (both for $40!!) so maybe my livingroom would stop looking like Craigslist! I would love to slipcover a chair in my living room, or find a match for it and do two!!! ooo. so many things to do! Maybe slipcover my chair…or do some pillows…or make a quilt. So many possibilities! Oh, do I have a couch in need of some help! So I would have to say material to slip cover that couch. I would use the money toward fabric for curtains for my sons' bedroom. Hi P&PD! Love the slips this week- I have an Ikea chair JUST like that in my garage!! Bright RED! I recently purchased your ebook and I am proud to say I just finished a slip for my first client! She loved it and I can't be more tickled! So with $75 gift cert I'd buy more fabric for slips and get more clients! I would make a slipcover for either my sofa or a few chairs. LOVELY! Ooooooh – I've been admiring your work via The Nester! And, I have a wing chair in our room that I'd love to makeover! I am already a subscriber. Does that count too? I would love to make a quilt for my bed with the fabric. I'd love to use it towards fabric to slipcover my sectional sofa …to a light blue color! Thanks for the opportunity. I'd love to have 75$ to create some new pillow covers. Pillows are my way to redecorate my white furniture! I'd love to buy some fabric to put up curtains in our play room! Thanks for the giveaway! I would love to start the quilts I want to make for my girls! What a cool giveaway! I'd probably buy fabric for drapes and/or shower curtain for my master br & bath redo. i want to make so many things and i am just starting out with all this fabric stuff and i need fabric…i dont have any…so this would be AMAZING!!!! i wanna make pillows and rolled fabric flowers… seriously need fabric! I would purchase fabric for beautiful white drapery for my bedroom. If there is money left, I would use the remainder to make my kids stuff, like pajamas or stuffed toys. I'd use the fabric to finally make a slipcover for a cool chair I found at a second hand store. Thanks for a great giveaway! Our house came with some really cheapy looking cornice boards in 3 rooms. I've always thought they would look much better upholstered. Maybe winning the fabric would get me started. I have several chairs that need to be re-slipcovered! Oh the damage that can be done with $75! Oh man is my master BR neglected! We need lush, gorgeous draperies! I would buy fabric for throw pillows and new curtains in my craft room. oh, I love to collect fabric- so useful, so pretty, so many possiblities- new house, new needs, probably curtans for the family room! I'd like to make a quilt for my second baby, who is due in April. Wow! I would love to buy fabric to cover my very old wing chair! thanks for this giveaway! I'd make new covers for the pillows on my couch! I have an Ethan Allen sofa (26 years) that is is in dire need of a crisp white slipcover! Keeping fingers crossed. I would make new curtains for my dauthers room and make baby quilt for new addition who will be here in 4 wks. I would buy wome fabric for some curtains for my sons' room. I'd use the fabric for our new house once we get married…either pillow covers, curtains, TBD. I would use the fabric to recover ma-maws chairs…they need some new love. I'd buy fabric for a project that requires no sewing. I could really use some color/pattern in my family room. I would use the fabric to make something for my children!! Thanks! I would buy white fabric to slipcover my old freecycle sofa. I bought a ready-made slipcover 5 years ago, but it gotten pretty ratty and I love the look of the slips you all made for Nester! I think I'd slipcover 2 armchairs. Or maybe recover a bench in our bedroom. If I won, I'd just wallow in quilt fabric…I am obsessed. Thanks! I would by fabric to update one of our living room chairs and to cover our dining room benches! Thanks for doing this! We are renting and have no window treatments. It looks like we will be here at least another year so I want to add a few touches to make it feel more like home. I would use the fabric for some curtains. I'm just finishing up my slipcovers so I'm not sure what my next project will be. I'm sure some new fabric could inspire me though! Oh- this is perfect! I desperately need to recover some chairs. Fingers crossed…. I have been looking for fabric to make a cosy winter blanket for each of my kids. This would be great! Inherited a lovely 60 year old couch that unfortunately needs a face lift. i's cover my ottoman. your work is amazing! I'm not sure what I would do with the fabric yet. I will just pick out my favorite and figure out what to do with it later. I'd get fabris for curtains. My couch and loveseat need a makeover so that is what I would use that fabric for…. I have a thrift store chair that I would slipcover! I have always wanted to try my hand at slipcovers so I would use the fabric to do just that. Thanks. I'd probably do something for myself or curtains, maybe even cheaters cloth for a quilt. I would like to make a beautiful quilt! This could inspire me to make a slipcover for my daughter-in-law's couch. I want to make a quilt or 2 for my girls! I would surely make some beautiful window treatments with this prize!! I SO need to pretty up my dining room chairs. Pick me, pick me, please! My house is begging you! I have this crazy ugly flower print couch that I've been wanting to make a cover for so I would totally use the money to get the fabric for this couch! Fabric!! my weakness!! I'd get fabric to make a quilt. omg…reupholster my dining chairs, recover seat on antique oak bench, valance for kitchen, make bedding/blankets for JCAPL rescue cats so they can lounge in style!!! Believe me, I will come up with something! If I had $75 to fabric.com, I would gladly slipcover my sofa and love seat in a bleached white or light linen color. As a newlywed who moved into her husbands bachlor pad… I am really excited about the possibility! I would use the giftcard to finally make a skirt for my bed. With my bed being on risers (to allow for more storage) I can't just buy a skirt from the store and have been putting off the project for about 2 years. And now I'm also a subscriber! I can't wait to read another great blog in my email each day! I would love to slip my sofa this winter, or make new curtains for the family room. I just finished slipping 2 wing chairs, my first slipcover project, and now want to do the sofa!!! thanks for the chance. I would use the fabric make new curtains for our living/dining room! I would buy fabric to use in my son's room. I can't find a bedskirt for him anywhere! Wow! So glad I found you as well. I would love to win. I too am a fabric addict! Fabric for a slipcover since I just got your e-book! I love to sew, so I would buy fabric to make some fun gifts with! I would love to work on my master bedroom. I've never really deocrated it (in 7 years of marriage!) A perfect fit quilt, some drapes, pillows – $75 would be a great start! I would use the fabric to make curtains for my breakfast room window and make a bench cushion for the seat at the table too! Pillows!!! I would make pillows galore and possibly do some framed fabric. Oh! My couch is in DESPARATE need of a makeover! What a generous giveaway. We are building a new house so there is a million ways I could use it! Probably curtains would be my first project. Thanks! I would love to slipcover a chair in my bedroom…it needs it in a BAD way! Thanks for a great giveaway! I have so many projects I want to work on. Bedding for my daughtes room, slip covers for my living room,slip cover for a chair that was my sisters. I so need some window treatments or mistreatments–something!!! We're closing on our first house at the end of this month and one project I'm really looking forward to is slipcovering two club chairs and a sectional that the sellers are leaving. They're from the 70's so they really need it! I'd get some fabric and learn to make slipcovers for our counter stools! count me in! I would probably buy your e-book and cover my nasty couch!! I would love to slipcover my couch, but I also sew all the time so who knows what I would make! I need some cute pillows for my couch and bed too, so maybe those! Oh, I would definitely use the fabric to make new curtains for my bedroom! I'd use the fabric to make curtains for my living room! Oooo what i would do w/ some fab fabric is recover the glider or make some window mistreatments for my bedroom. New curtains for my bedroom. But with fabric, the possibilities are endless, so you never know… =) Thanks for the opportunity! Curtains!! Or cover a chair if I find one that I like before I make curtains…lol. I have no idea what I'd make! I sew almost daily so I'd just have to wait and see! LOL! Thanks for the chance to win! I'd like to use the fabric to make some curtains for my bedroom. Perhaps you could even show me how?! I actually do need to recover my couch cushions (thanks to my cat, my son, and my husband). So I would either use it for that or to feed my other sewing obsessions: quilting and dressmaking! I got a chair and a half for free a while ago, I would love to get fabric to make a slip cover for it! I would love to make curtains and pillow covers or maybe a slip covered chair! I'm a follower, wasn't sure how to subscribe? I need fabric to redo my son's “baby” room for our adopted daughter we'll be bringing home in 2011! Wow! I would love to win this giveaway. I would either buy fabric to make a slipcover, of course then I would have to buy your book too 🙂 Or possibly buy fabric to make tableclothes, etc. for my wedding reception! I desperately need new pillow and a cushion for a bench! We're buying a house this winter, so I'm sure there'll be gobs of stuff to use it for! Oh my goodness! I have two couches that desperately need slipcovers!! Thanks!! I would buy fabric to make two bedskirts,and pillows for each of my daughters rooms. Wow, this is great!!! Thanks so much. I don't like the drapes I have now in my living room…I'd like something with more color and a print. I have a friend who would make them for me, just need the fabric! Oh what a great giveaway! Our next baby is due in Feb and I have been wanting to slipcover a rocking chair and ottoman for the nursery, but my dream fabric is so expensive. This would help so much! Also I would love to make toile curtains for the room… Thanks for the chance to win! I would use it to buy fabric for a friend to make something out of since i don't sew. Oh pick me! I'd totally buy fabric to make a slipcover for my ugly blue couch! I have a new baby niece coming in a month that needs a sweet little quilt. and maybe I'd make some new pillow covers too. I would get fabric to make so pillows or get a quilt!!! I really need to make some covers for my pillows. I'd also really like to make a table cloth for my table! I'd buy some fabric for my couch, but I've also been wanting to try a quilt, so who knows!?! I'd love to have some fabric for new curtains! I would purchase fabric to make some mistreatments for my bedroom that I am slowly redoing. thanks for the giveaway. I need to reupholster some big chairs — awesome giveaway! I would LOVE this! As soon as I finish with grad school in December, I'm planning some window treatments, pillow covers, and maybe chair covers using a few different Premier Prints fabrics, which I'll be getting either way. This gift card could allow me to do a little more, rather than buying fabric bit by bit! I'd use it to make curtains for the room we're remodeling. I would love to use it to make a quilt. I just refinished my dining table and now I want to make some slipcovers for the chairs. Freebie fabric might be enough motivation to overcome the fear! I would make a duvet cover for twin beds I am getting for our farm. I would definetely use the gift certificate to buy fabric to make my window panels in my living room!!!! I want to make a quilt! I love fabric!!! I have a parson's chair that desperately needs a slipcover! Here's hoping! I'd get some fabric to make some new skirts I've been wanting to make, and maybe I'd try my hand at making a quilt, too. I would make my first slipcover for a sofa. K, ever since I first saw you help the Nester slip cover her couch, I have been determined to learn to do this on my own, even going so far as to ask my husband for your ebook for Christmas. We're buying our first home and we're set to close the week of Christmas, so I would use the gift card to buy all manner of fabric for curtains, slipcovers for our couch, dining room chairs, and basically any other thing I could stretch the fabric out to cover. =] Regardless of whether I win the gift card, I'll definitely be using your ebook to make some magic, so thank you! I could use a ton of fabric for pillow covers and window treatments! Oh! I would get 15 yards of something and recover my sofa…which is rococo and has wood carved frame all around it, so I don't think is a candidate for a slipcover. If you have a better idea, please let me know! Upholstery channels, as it has now, intimidate me! I have subscribed for quite a while! I love your site! I would use the fabric to make a lap quilt for the couch and to make some new pillow covers as well. I would also be suckered into making a dress or two for my daughter. Who doesn't love fabric! I would love to make some window treatments!!! I would make a duvet cover for my bedroom. I have a serious obsession with fabric. I'm a sew-a-holic and will always look for any excuse to cover the world around me in fabric. LOL. I'd love to get some new stuff to make pillows for my couch, and I'd like to make a play tent for my kids . . . stuffed animals, purses, bags, you name it! Please pick me! I'd love fabric to make some window treatments for my daughter's room. Oh my goodness!! I have been on fabric.com obsessively the last few weeks–I have several fabrics picked out for window coverings and pillows for my bedroom (in dire need of help) and my living room! I would LOVE this! I'd buy fabric to make cushions for our dining room table and bench! I'll make some bedding for my “british nursery”, where my kids ages 4, 3, and 18 months will soon be sharing. Planning to join your slipcover party this month too! I would buy fabric to recover a bench in our master bedroom. It's the only room in the house that hasn't received any attention. I'd use the fabric to make some window treatments. Thank you for the giveaway! I would use it to buy fabric to make window mistreatments for my dining room, and maybe my bedroom. I love fabrics! I have a vision of making a quilt for my family. Oh, the possibilities!! I would love to slipcover my couch, but don't know if I'd be up for the challenge or not. I'd love to make some curtains or perhaps attempt a quilt though. Thanks for the great giveaway!! I'd love to start making some curtains or a duvet for the bedroom of the little girl that we're in the process of adopting! I actually do want to recover my sofa, it is in desperate need for it. Maybe some pillows as well. Thank you for your generous giveaway! I would use it toward making a slipcover for my couch or a couple of kitchen/dining chairs! I have no idea what I'd do with the fabric! But I love fabric. Maybe I'd stock up on basic colours or notions…or maybe recover our basement sofas. That would be fun! I would buy fabric for my bedroom window treatments! what a great giveaway! Thanks! My house is lacking in the window treatment/ pillow area, so I would get something to fill that need! jhales_finance at yahoo dot com! I would buy fabric to make bags for Christmas gifts. I would use some fabric to make some pillows for a window seat I have been wanting. Thanks to the inspiration from you and The Nester, I have started slipcovering all of my furniture with white cotton duck. I would buy the 20+ yards I still need to cover my sectional couch. I also have my eye on some turquoise linen at fabric.com to make some painted tea towels for my kitchen to match my new turquoise accents. Thanks for the giveaway! Oooooo…..I have a fabric addiction! I would love to make a lazy girl quilt! I think it would make a fantastic quilt! A friend is on a very tight budget and jonesing for new curtains so I would buy the fabric she wants! my daughter has informed me she wants DRESSES – lots of dresses! So, I've got some great, simple patterns but no fabric! My sofa needs recovering and a new slipcover would be perfect. I have tried loose ones but I think a custom one would be perfect. This could be the perfect opportunity to break out the sewing machine and get creative!! I want to slipcover two chairs and an ottoman! I would make valances for my playroom. I have my eye on some sweet ABC fabric. I would make curtains for my office…because I can't seem to find any in stores that I like and I've been looking for at least a year now. I would finally make me some curtains for my living room. We have lived here for three years and I still haven't had to money to make curtains. I would buy fabric to cover a chair I just scored at a garage sale for free! Want to use it for a comfy reading chair. I would purchase fabric to cover a chair. Just scored a free one and would love to make it a comfy reading chair. I'd buy fabric to make my first attempt at roman shades — for my new house with no curtains! I'd use the fabric for new curtains!! I would love to buy some fabric just to help beautify my home in whatever ways I can. My husband has a lot of down time right now while awaiting a surgery, and it would be nice to give him something beautiful to look at while he's stuck here so much. I'd buy some fabric for my first attempt at making roman shades — for my new house with no curtains! I'd buy fabric to recover 2 funky chairs I recently picked up! I would LOVE to make a slip cover for my favorite (totally ugly) chair. I'd love to make new pillows for my den! I'd buy fabric to make pillows and blankets! I would finally make some mistreatments for my daughter's playroom! It currently has lace curtains the previous owners left … 6 years ago! I'd buy fabric to reupholster some chairs from my great-grandmother that I love the shape of but hate the tacky orange chenile fabric! I would love to learn how to slipcover this sad, white armchair that is the MOST comfortable chair in the world, but abused by my children! The $75 toward fabric will come in handy! I would use the fabric to beautify and spruce up my home a bit. My husband has a bunch of downtime wile awaiting the surgery, and I would love to give him something nice to look at! I'd use the fabric to make some new mistreatments for my living room! Thanks for the chance to win! I would love to make a quilt for my bed. I would LOVE to win this! I have two chairs that desperately need slipcovers. Thanks for offering this! I would reupholster the two purple chairs in my living room! I always need new quilt fabric! I just bought a fun little chair I want to slip cover for my daughters room. Would love a book on how to sew a cover correctly. Such a good giveaway! I would slipcover a chair in my living room. I bought it on the cheap a few months ago but it MUST be slipcovered!! I would LOVE to have that much to spend on fabric, *swoon*! Curtains? Aprons? Bags? Pillows? ?!?!?! There are so many things I don't even know where to begin!! I would make purses/bags all day and night! I very badly need to get fabric to slip cover the pads on my rocking chair! I would recover my favorite chair! I have two chairs that are in desperate need of a slip cover so this giveaway would be perfect! I'd make new pillow covers for my couch! I would love to make some new curtains for my freshly painted bedroom and some throw pillows. Thanks for the giveaway! I'm thinking I would maybe attempt a chair slipcover. I've never made one though so it's kinda terrifying. I could do so much with this! I have a sofa and two chairs that I want to slipcover! I love your blog and seeing all of your great ideas! I would buy enough fabric for a shower curtain and to cover my chair and barstools! I'd buy fabric to mistreat windows in our new rental house! I'm a Google Follower. Does that count? I would love some fabric for a slip cover! Need to re-cover a chair picked up on the side of the road… Good bones, but needs new upholstery! Perfect! I need fabric to make a slipcover for a sideboard, and a print for Duvet cover I'm making my mother-in-law for Christmas. I would probably make new pillows for our living room and get some non-baby cute fabric for our 2nd baby coming in June! Fabric.com has a great selection of organic fabric too! I'd get some fabric to have one of my living room chairs redone and to make some kind of window treatments. I would probably do something semi-major. Maybe a new bedspread. Bedroom makeover, here I come! I desperately want some pretty fabric to make curtains for my foyer! I have two bare windows in there! I'd buy some houndstooth fabric. I can't find any around here! I also need some fabric to make a cushion for the stool I just repainted! Just found your blog, but I love it and I'll definitely be back! I would use the fabric to make pillows for myself and for my mom and mom-in-law for Christmas! Now a follower of your blog!! I would love to make baby bedding for my nursery, and curtains maybe! Oh my goodness!!! Seriously? I can not imagine a nicer giveaway! I'd probably get fabric for a couch I've been redoing for 2 years now. Yes, a slipcover would be a great idea! I know my daughter has hand-me-down and second-hand furniture that could use a lift, until they can get new. I'd use it for that. The sky is the limit! I have lots of ideas, not so much time. But you have to have the fabric to start sewing, right? Thanks for the giveaway. I really want to make a quilt for my bed. We don't have anything for our bed and it looks kind of sad. LOL. I'd buy fabric to slipcover my poor chair and a half and ottoman, it's thread bare and needs work but it is the best chair to read to my kiddos in. I bought your ebook and would LOVE some fabric to finish my couch!!! Im in the middle of attempting my first chair. I'll send you pictures! This would be so helpful for buying fabric for curtains in our new family room. Thanks for a great giveaway! I would love to make some new pillows for my couch . . . and really I'd love to slipcover our loveseat but I'm just not sure that I'm up to that yet! i'd love to slipcover our ancient stained sofa! I'd love some fabric to make curtains for my living room! I just bought an old bench and I need to have a cushion made for it.Thanks for counting me in! I'd love to make some new curtains for my kitchen. Plus I've been making handbags. I would love to win! I'd make a cozy lap quilt for the coming cold winter months. Thanks for the giveaway! I would buy fabric to cover my husbands favorite chair! It's a very close match to the Dad's recliner on Frasier..needless to say it's in dire need of a slip!! I think I would like to try my hand at a quilt. That's what I'd buy! I would buy fabric to cover my red and cream plaid sofa!!!! I would recover my couch, thanks! I would purchase fabric to slip cover my couch! Great giveaway – thanks!! I want to make a quilt so bad! I would buy fabric to make some new curtains!! I have two old chairs in excellent but ugly condition that I would like to slipcover. Thanks for the opportunity to win! I would use the fabric to cover this fabulous chair I have but the fabric is in terrible condition!! I would use the fabric to slipcover a wing back chair that I bought off craigslist for $40! And of course if there were any extra fabric save it for another chair, let the hunting begin! Thanks! OMG- what WOULDN'T I do with the fabric…….. Table runners, valance for living room drapes, apron for my daughter, pillows for my sofa, dining room chair covers, collect it, stare at it, flaunt it, show it off……etc! I love fabric! 🙂 and there's so much I need to do with it haha – we move into a new house in a month or so — which means lots of fabric decorating needs! I would like to make myself a new duvet cover and some matching shams! I was thinking of buying fabric to make more blankets and burpcloths for all the preggo friends, but after seeing your lazy girl quilt, I decided – I WANT ONE!!!! So there it is. Now I have to have one! I would get some of the Amy Butler fabric I have been wanting. I need some great fabric for upholstered headboards for my daughter's bed and mine. I want to re-do my sofa pillows and my bedroom. This fabric would be wonderful! Thank you for the giveaway. I really need to make a slip cover for our sofa. Would love that gift card! 🙂 So thankful for my family… Thanks for the chance to win! Kitchen chairs need to be recovered badly!! I don't know how to sew, but this would sure motivate me. There is a group of ladies at my church who meet and sew, and they would help me make a couch slipcover since mine is covered with a blanket right now. Definitely recover our 1970's red corduroy chair…yes you read that right. Soooo out-of-date but also so comfortable! I would buy fabric for new living room curtains. With $75 worth of fabric I would make 5 roman shades for my new kitchen in some really pretty, bright and happy fabric. And I will check out your method for slipcovering furniture so I can eventually slipcover my family room sofa. I would love to buy fabric to slipcover an ottoman! I just subscribed to your blog so would love to be entered in your giveaway a second time. Oh, and I'm going to check out fabric.com whether or not I win. Thanks! I'd like some fabric for curtains or new seat covers for my dining room chairs. That lazy girl quilt is beautiful! I would love to buy fabric to just roll around in it on the floor… or make a quilt, this time just for me! I've been learning how to make pillow covers and would love to get my hands on some awesome fabric to make some for my bed! I'd definitely try to make a slipcover. I'm sick of my couch. I'd love to make some window mistreatments for our living room! We've lived here a full year and still no curtains… this would be just the motivation I need! I have been wanting to slipcover my ugly couch and a matching arm chair! Great giveaway! I'd order the fabric to slipcover my kitchen table chairs! Awesome giveaway! I would love to buy fabric for all sorts of projects – curtains, pillows, slipcovers, etc… Fun, fun, fun! I would love to finish my kitchen curtains, and buy lots of soft fabrics to make my new baby a new mommy made quilt! New curtains for my bedroom – it would atleast get me started. . . we have 3 walls of windows!? Thanks! I would choose fabric to slipcover a wingback chair. Thanks for the chance! I have become a subscriber! Ooh, I bought your ebook last summer and I SO want to slipcover the couch in our front room. You made it seem do-able. Money for fabric would get the project underway. I would love to slipcover my living room funiture!! I would buy fabric to cover seat cushions on two antique dining chairs I bought last year. They still have the same “grandma-embroidered” seats!! I would buy fabric to recover my husband's old yellow/gold VINYL chair he won't let me trash. It used to be gold leather, but his parents took the leather off to repair their couch and had it recovered in “matching” vinyl before giving to my husband. It's such and eye sore, I can't wait to make it cute one day! I have another sleepersofa to recover. This one is currently red courdoroy. Weird! I already have the ebook and have used it for several pieces! There is no telling what kind of damage I can do with %75 of fabric. Huz and I have been discussing slipcovers though. I have a BORING chair that needs a pop of pattern!! I would love to either slip cover my couch (my kids are doing a number on it!) or make new drapes for the living room with matching pillows. I'd use the fabric to bring my cube ottomans out of the colored, stained, and wrecked darkness they are in! I would so be making a new duvet cover for my bed!!! …and some pillows!! Curtains for our bedroom! I'm so done with having naked windows! I'd buy fabric to sew a duvet cover for my son's room. I would buy some fabric for our baby's room- due in Jan- just need a few more fabrics to finish everything up! Otherwise I'm a fan of quilts. I'd love to give out some quilts for birthdays next year! I'd use it to make curtains and/or bedding for our baby tha'ts due in a month. I would buy some lovely red and white toile to recover the seats in the dining room chairs before Thanksgiving! i have a light pink armchair that i would love to upholster/ make slipcover for. it was my mom's & i can't seem to part with it because i know i could make it fabulous!! I would buy fun fabric to make a slipcover for the well loved chairs in the waiting room at the Pediatric Speech Therapy office! I'm new to sewing and am so motivated to do many fun things! I'd get a lot of fun projects started with the fabric!! Fabric for curtains in my living room! I want to make slipcovers for two foot stools and window treatments for the kids bedrooms. Man, I love fabric. The four teenagers in my house are wearing out the couch in the game room…it needs a slipcover so badly!!! That is what I would do with the fabric!!! Fantastic giveaway! I would reupholster a chair and make some new drapes for my front room! I desperately need a new sofa slipcover. Please let me win! I have recently redone my kitchen but still have finishing touches to complete. This was a long overdue remodel (25yrs in the making)and I have saved long and hard for it. I would love to pick out something fashionable and fresh to use to make window treatments. This $75 would go a long way in making that happen. Quilts quilts, quilts…need I say more? I'm in the process of finding the perfect chairs for my sitting room, but since I'm super cheap, they won't be new. I am preparing myself to recover these elusive chairs, and this fabric money would be fab!!! I am going to attempt to recover my first chair! I would buy fabric to slipcover my couch–I'm ready to take the plunge into white slipcovers! I would like to make curtains or pillows! What a great, GREAT giveaway! I would make some curtains for my daughter's room and maybe some new pillows for my couch. I would buy fabric to cover some old lampshades, make pillow covers for old decorative pillows and make a few fabric covered canvases to give away for Christmas. I'd purchase fabric for our master bedroom – new window mistreatments? Yes please!! I would love to be able to slip cover my ottoman and add new pillows to my living room. I would buy fabric to slipcover or recover my great grandmother's chair. I'd buy fabric for new curtains for the living room, slipcover the recliner and matching pillows! I would get fabric to make pillow covers and a quilt! 🙂 Thank you!! Oh, I so want to slipcover my couch. So that's what I'd do with it! Yum! I seriously need to slipcover a couple of benches & some dining room chairs. I would love to make new curtains for our bedroom and slip cover our couch. Oooooh… Don't laugh but, I want to slip my stack of 5 nap cots (I have a family child care business) to make it look like a mini sofa for the kiddos to read on when it's not nap time! I would definitely use the fabric to slipcover my sofa! I'd totally buy fabric to slipcover my fugly sofa! I'd also buy something fun, like the watermelon fabric I've been eyeing to make a basket liner for my bike basket. But mostly the slip cover. I would make another quilt. I've got plans but no fabric yet. I have a hideous futon in my guest bedroom at the moment that is begging to be covered!!! What would I NOT do with all that fabric! thanks for the opportunity! Thank you for a chance to win! I've been wanting some new drapes in the living room – a win would mean learning how to use my sewing machine and going for it!! oh man i love fabric… what WOULDN'T i do? quilt for baby #2 on the way, quilt for big sister's new big girl bed, reupholster my dining room chairs, new couch throw pillows and cozy snuggle blankets… 🙂 thanks for a great giveaway! We just moved into a new house and are in desperate need of some curtains. I would slip my couches! What would I do with my fabric? Whatever is easy (since I don't know how to sew). But I DO know how to use stitch witchery and fabric glue. 🙂 Thanks for the cool giveaway. Our living room windows are crying out for curtains! Thanks for hosting such a great (and useful) giveaway! I would like to make new curtains for my living room!!! i would like to get fabric to make curtains in our courtyard! Well its a matter of where to stop. Definately new curtains for my daughter, re-cover a couch, new cushions, I could go on and on…. I would buy fabric to make bedding for my baby boy, due in March. I would buy fabric to make window treatments for my kitchen. Perfect timing! I just blogged about wanting to recover a chair. It would be wonderful to win fabric for this project. I hope you will visit and enter my giveaway too. I would really love to make some fabulous window treatments for our new house! I would make a slipcover for my Love seat!! I would buy fabric to make a slipcover to this nasty orange wingback I picked up at the habitat store. I know she can be beautiful with the right gown. i would use fabric to make a new duvet cover for my guest room! I'd recover a queen anne sofa that has horrible tapestry fabric on it! I love Fabric!!! I want to make some new bedding for my bed. I am playing around with Navy blue…brighter kelly green and maybe grey and white. I would slip cover the chair my friend just gave me! I would pick out some graphic fabrics for new pillows! I would Finally make a slip cover for the huge ugly blue velvet wingback chair I bought from the thrift store for $30. ahh! definitely buy the beautiful yellow dandelion fabric featured on Much Ado About Mothing's sun room (now living room) chairs! I would get fabric to slipcover my living room couch. You got it. Slop cover Grandma's couch and chair we inherited, just in time for our New Years eve house warming party! 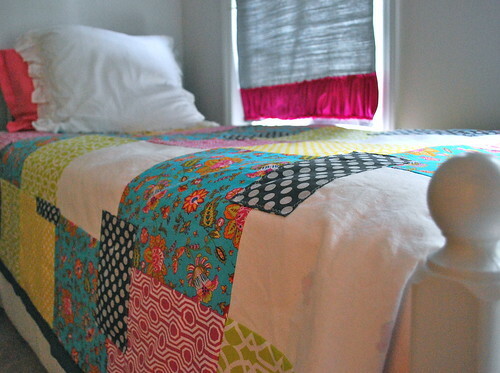 I would love love love to make one of your lazy girl quilts! so cute! I would make some pillows and a blanket for my baby! I'd like fabric for new curtains, pillows and possibly slipcovers. I'm still timid about trying that!! Oh I have so many things on my list right now to make. This would be perfect to help me get started! I need to make a slip cover for my couch, drapes, slip cover a chair in my room, pillow and more drapes. Can you tell I just moved into a new house? I want to make a roman shade for the window on the way up the stairs. Ooo, I would definitely use it to buy fabric for curtains. I just finished slipcovering my couch and arm chair through your inspiration! It looks fabulous and I now love my living room! Would love to make a quilt as well…hhhmm…which to buy? Curtain material or quilt material? Or Pillows? The world may never know! I would make a great ruffled slipcover for the foot stool in our living room! I would use the gift card to make drapes for my new mom room, aka old dining room. i would love slipcover a couch and this would be the perfect jump start to that project! I'd love to give that quilt a try! It's adorable! I would use the fabric to sew a duvet cover for my two-year-old, who is ready to graduate to a big boy bed! I would love to win this giveaway. I have had “make new pillows” on my To Do List for about 6 months! Great giveaway. Oh and I forgot to add, that I'm a new subscriber to your blog. Can't wait to sit down and read more. I'd make some window mistreatments for my girls' bedrooms! I have a list of fabrics from Fabric.com that I could do dozens of wonderful things with. this is the only way I will be able to order, a dream come true! I would definitely have some curtains made! I do not have a single curtain in my house and I would like them in several places! This would help so much! I'd use the fabric to make crayon aprons for my kiddos for christmas and to slipcover my couch for my new house!! I am in the market for new window treatments…for the whole house! I would LOVE to find the perfect fabric for a kitchen valence and dining room curtains. Whoa! The best giveaway EVER!!! If I had more fabric I would mod modge the outside of my house. Or….restock my etsy shop with lots of new handmade items! I recently took the doors off my kids closets and would buy fabric to hang like a curtain. Our living room could use some more inspiring curtains… I could use the fabric for that! Once I'm finished making my slipcovers for my sofa AND love seat (thank you Lazy Girl's Guide to Customer Slipcovers! )I would love to buy fabric to make some curtains, and then slipcover a chair, an ottoman, and then, OK I need to stop now. ok, i would def make something for my baby on the way! YAY! I have a couch pillow from a very old couch named Myrtle. Tragically my husband had to let her go when we got married but I kept the pillow for him on the condition that I would cover it and keep it in our home as a mommentum from his bachelor days. So I would use the fabric to cover that and a few other pillows along with making duve or quilt. I would slip cover a couch or chair but I don't have one yet. I would slipcover a wonderful chair that I picked out of someone's trash. I was going to have it reupholstered until I saw the slipcovers. Never thought about doing that. What would I do with $75 worth of fabric. Probably buy it and then lay around crying wishing I could hire you to come over and make me a slip cover. That is more then likely what I would do. I could make so much but I'm loving that lazy girl quilt! I love quilts! I need bedroom window coverings. We repainted and changed colors in the room and haven't quite finished it yet. I would slipcover our funky couch.